After completing their education at Bob Jones University and living in Greenville, SC for several years after that, Randy and Kathy answered the call of the Lord for Church Planting and Ministry to Native Americans in the West. 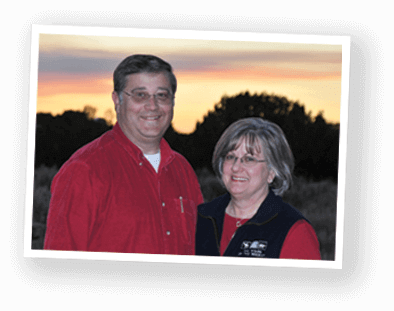 The Lord moved them to Arizona in 1988 where they planted Living Waters Baptist Church. Camp on Wheels acquired expedition tents for cabins, kitchen, and staff, circus tents for chapel, and a portable bath house. Needless to say this was very labor intensive, but God blessed in a tremendous way, and life long memories were made. As Camp on Wheels grew the need for a permanent location to make as a home base became evident. In the fall of 2007 God miraculously provided property located in the White Mountains south of Springerville, Arizona. This new property will not only be the home base for Camp on Wheels, but a permanent year round camping facility. Since this camp facility is not a “Camp on Wheels” a decision was made to rename the organization “Grand View Ministries”. The camp was given this name not only because of the stunning views on the property, but it also fits our goal of letting our campers see Christ through his creation, his word, and his people. From 2007 to our grand opening in 2014 and continuing to this day God has brought hundreds of volunteers from across the country as well as key full time staff with many years of camp experience. These people sacrificed greatly of their time and labor as they came together to build an incredible facility. 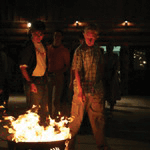 With beautiful cabins and a stunning lodge, Grand View has now hosted camps and conferences for churches and groups throughout the Southwest, pointing thousands to Christ. Matt grew up in Sanders, AZ and one of the most impressionable things in his life was a yearly trip to camp each summer from the time he was six years old. Camp has had a lasting impact on his life. He worked at The Wilds of the Rockies for six summers during high school and college. 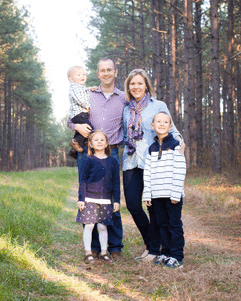 After completing his undergraduate degree in Bible at Bob Jones University, he joined the Dean of Men’s staff at BJU where he served for 6 years while completing his Master of Divinity. Matt married his wife Rachael May 12, 2006. In May 2011 they moved to AZ to join the staff of Grand View full time. Matt and Rachael are passionate about investing in the summer staff and helping them pursue the next step the Lord has for them. "WE SEEK TO MAKE A DIFFERENCE FOR THE CAUSE OF CHRIST."